This pudding, made from large pearl Tapioca and coconut milk and served warm. This is much lighter than the Western-style version. You can adjust the sweetness to your taste. Serve with any kind of chopped fruits. This pudding, made from large pearl Tapioca and coconut milk and served warm. This is much lighter than the Western-style version. Soak the tapioca in 1 cup warm water for 1 hour so the grains swell. Drain after 1 hour and keep aside. Put the 2 cups of water in a pan and bring to a boil. Stir in the sugar and salt. Add the tapioca and coconut milk and simmer for 10 minutes or until the tapioca turns transparent. Mix the chopped fruits with the freshly made orange juice. 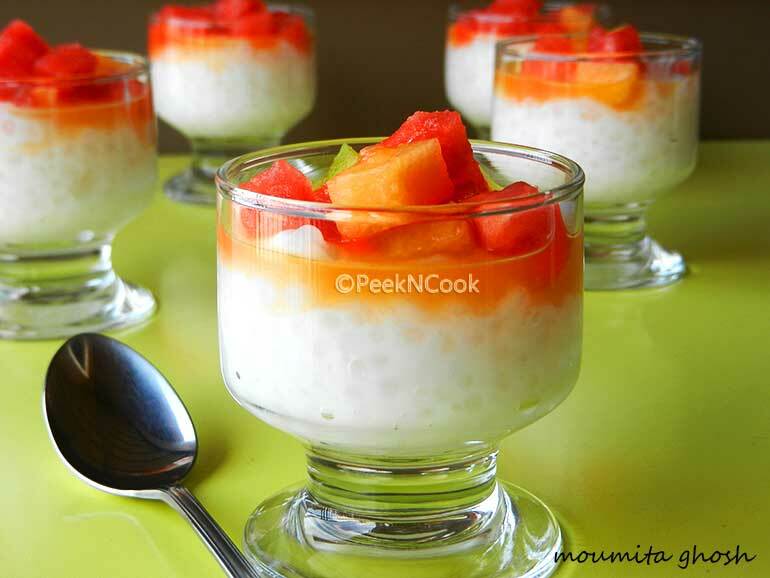 Serve warm tapioca pudding with the fruits and juice topping.